A “fast break” is a term used to describe a situation where a root canal disappears on a radiograph as you move apically. 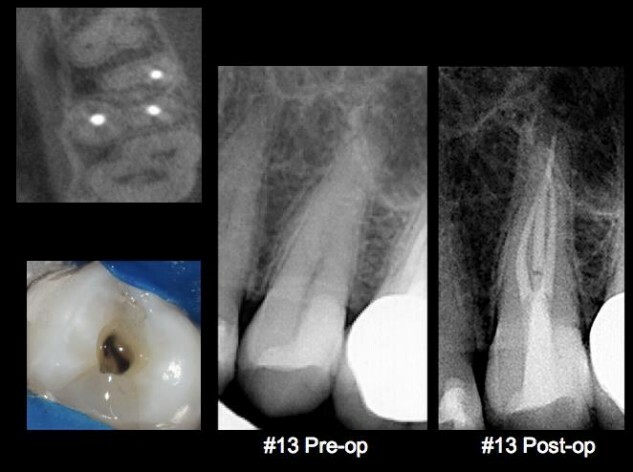 This happens when the main canal splits into multiple smaller canals that are not discernible on a radiograph. CBCT axial views are indispensable determining the number and location of these canals. Tooth # 13 (seen at the top of the CBCT axial view) branches into three canals. Note how a conservative access can be used to locate even multiple canals when their location is known prior to starting the case, significantly increasing the long term prognosis by preserving peri-cervical tooth structure.